Evergreen Cemetery is an old cemetery in Southgate, Campbell County, Kentucky, having its first burial in 1849. It is the largest cemetery in the county, with tens of thousands of burials. It is a neat cemetery to walk through, with many old monuments and headstones, though the hills are a bit of a challenge at times. Unfortunately, it is need of help as the following release shows. Underneath it, I have attached a couple of links with more information on Evergreen, and a couple of pictures I took of the plot for soldiers in the United States Army during the Civil War. 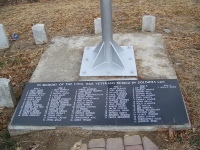 One shows a list of burials in the plot, created by a Boy Scout troop a couple years ago and another shows the entire plot. Among soldiers buried there are William Horsfall, who received the Medal of Honor as a 14-year-old and Augustus Seither, who had two brothers fight for the United States (as he did) and another for the Confederacy. Confederate General George B. Hodge is also buried in the cemetery, though not in the same area as the Union soldiers. The Board of Directors of historic Evergreen Cemetery in Southgate, Kentucky, is seeking help from the community to improve the roads within the cemetery. The cemetery was founded in 1847 and is the location of approximately 65,000 burials. It is also the site of Shaler Battery, an encampment built during the Civil War by the Black Brigade. The cemetery spans 400 acres of land and has eight total miles of roadway. Some of the roads are in disrepair and in need of immediate attention. The estimate for repairing all areas is $850,000 (estimated at between $75,000-$85,000 per mile). This figure is out of the reach of the current budget of this not-for-profit cemetery. The Board of Directors is reaching out to the greater Cincinnati area for financial donations toward this effort. Donations from local businesses, churches, community leaders and private citizens are welcome. All donations to the cemetery are tax-deductible. Every dollar donated will contribute to a span of roadway receiving needed repairs. In 2014, the Board of Directors formed the Friends of Evergreen Cemetery volunteer organization to initiate and oversee various projects that will restore and revitalize Evergreen Cemetery. If you are interested in donating your time and talent to the Friends organization, please call Andrea Janovic at (859) 391-7218. You can also friend the “Friends of Evergreen Cemetery – Southgate, Ky” Facebook page to stay current on news and events relating to the cemetery. The next meeting of the Friends of Evergreen Cemetery will be held on August 27that 7:00 p.m. at the Ft. Thomas Antiques & Design Center at 90 Alexandria Pike, Ft. Thomas, Kentucky. Call Andrea Janovic at (859) 391-7218 for further details. Here is a link with more information on the cemetery's history and here are some pictures I took of the plot and the headstones in it. 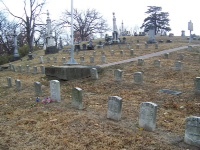 As you are well aware, it is also the site of Battery Shaler, the second version of which can be found in part at about the highest part of the cemetery. Good post! Interesting to see the efforts at Evergreen! True. I just rob ably should have focused on that more. I also think a post about the Southgste family, particularly Nathaniel Southgate Shaler, would be nice, but I have not worked on that yet. His non-Civil,War career would require a lot of research, but maybe I will tackle him in the near future.